Bees are an integral part of our ecosystem. A garden with happy, healthy bees grows happy, healthy plants. Why not help these friendly pollinators even more by building “bee hotels”? There are 4,000 species of bees that are native to North America and they are far more efficient in pollinating than the more commonly known European honeybee. Native bees are losing habitat at a dramatic rate and this is leading to a huge decline in population. You can help save these bees by creating a house for them in your garden. The bees will gladly thank you by pollinating your garden! Over 90% of all bee species are solitary. This means each female will build her own nest in close proximity to other females of the same species. 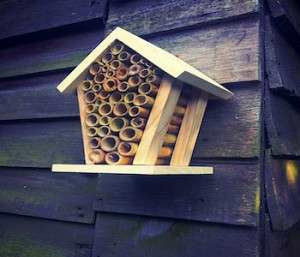 Bee hotels are usually made out of some sort of box or container that is filled with sticks, pinecones, bamboo shoots, or logs with drilled holes in them. 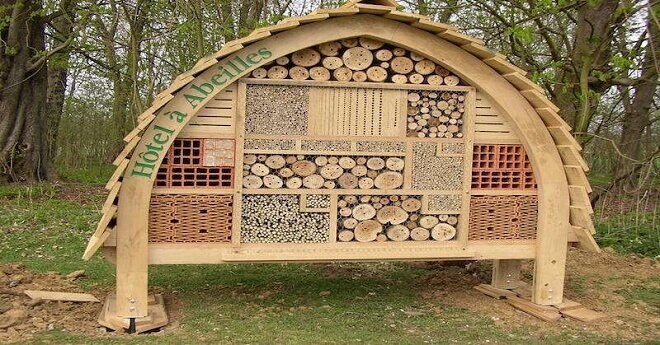 These homes provide choices for bees and give them with shelter. Building a “bee hotel” only take a little bit of effort and material you probably already have. You use bee houses to decorate your garden with these simple ideas. You can use license plates to make sturdy roofs for your bee houses. You can repurpose a birdhouse for the house base and fashion a bent license plate on the top to create a cool roof. Take off the walls of a bird house and use the framing. Add either blocks of wood with holes drilled in them, or pieces of bamboo stalks to create small living areas for the bees. You can use cardboard, clay pots, and bricks to create hibernation areas for your native bees. Use left over material you have no use for and put them together in an area by your garden. You can put sticks, pinecones, and cardboard all together in a clay pot and create an area for the bees. Situate them together nicely and create a beautiful creative hodgepodge of recycled garden material. 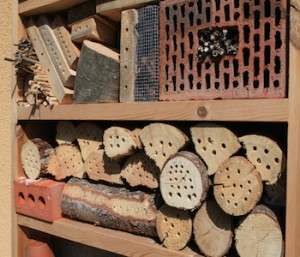 You can use cinderblocks to create multi-storied high-rise bee hotels. Put bamboo stalks or a a stump drilled with holes into the cinderblock gaps and create a nesting area for the bees. You can paint the cinderblocks to add some color to your garden. Cinderblocks are great to use because they will protect the bees from the elements. Fill a mason jar with bamboo cuts or small tubes and create a wonderful small living space for bees. You can find an area to set it in your garden or you can suspend it from a branch or shed. You will be able to watch the bees move in because the bamboo tips will be filled with mud and other material. Fill an upcycled wine box with bits of wood or bamboo canes and arrange them artistically. You can use different kinds of material for the nesting pods to add texture to your bee hotel. Honey bees are not the only bees that need our protection and help. Add these quirky decorative homes to your garden and watch as the bees graciously thank you!